After 9 rounds played we can already see who rules in the LNBP and who belongs to weaker ones. Here is the last round review presented by ESL. The most exciting game of round 9 in the LNBP took place in Michoacan. This derby game ended with only three-point defeat on the road of 6th ranked Abejas (4-5) to first ranked Aaguacateros (7-1) 78-75 on Sunday evening. Host team only slightly avoided a big embarassment. Great defensive blocking was one of the keys in this match when Aaguacateros made 7 blocks. Colombian guard Michaell Jackson (190-87) stepped up and scored 15 points and 7 rebounds for the winners and the former international power forward Arim Solares (202-83) chipped in 10 points and 10 rebounds. The best for the losing side was American swingman Zack Irvin (198-94, college: Michigan) with a double-double by scoring 16 points and 11 rebounds. Aaguacateros have a solid series of four victories in a row. They maintain first place with 7-1 record. Abejas lost third consecutive game. They dropped to the fifth position with five games lost. Aaguacateros are looking forward to face Soles (#4) in Mexicali in the next round. Abejas will play at home against Angeles and it may be a tough game between close rivals. Very important is a road loss of third ranked Soles (4-4) against sixth ranked Libertadores (4-6) on Sunday night. Visiting Soles were crushed by Libertadores in Queretaro 115-95. The former international guard Cezar Guerrero (185-92, college: Fresno St., agency: Best of You Sports) nailed a double-double by scoring 30 points, 11 rebounds and 8 assists (perfect behind the arc making all five shots) for the winning side and Brent Jackson accounted for 32 points and 7 rebounds. International guard Luke Martinez (193-90, college: Wyoming, agency: Pro Sports) came up with 23 points and 6 steals for Soles in the defeat. Both coaches used bench players which allowed the starters a little rest for the next games. Libertadores maintains sixth place with 4-6 record. Soles at the other side dropped to the fourth position with four games lost. Libertadores will play against league's second-placed Capitanes in Mexico in the next round and it will be quite challenging to get another victory. Soles will play at home against the league's leader Aaguacateros and hope to get back on the winning track. The game between Top Four teams took place in Torreon. 4th placed host Laguneros (3-5) lost to first ranked Mineros (9-1) 93-83. The best player for the winners was Jonathan Rodriguez who scored 20 points, 9 rebounds and 5 assists. Mineros' coach used a ten-player rotation and allowed the starting five to rest. At the other side the best for losing team was PJ Reyes who recorded 18 points. Mineros have an impressive series of six victories in a row. They maintain first place with 9-1 record. Laguneros lost third consecutive game. Newly promoted team keep the fourth position with five games lost. They share it with Correcaminos. Mineros will have a break next round, and it should allow them to practice more before next game. Laguneros will play against Huracanes (#7) in Tampico and hope to secure a win. Bottom-ranked Huracanes (0-8) is still winless. This time they lost on the road their eighth consecutive match to fifth ranked Correcaminos (3-5) 114-84. It was a good game for JR Giddens who led his team to a victory with 36 points (!!!) and 9 rebounds. The winner was already known earlier in the game, so both coaches allowed to play the bench players saving starting five for next games. Correcaminos moved-up to fourth place, which they share with Laguneros. Huracanes lost their eighth game in a row. Newly promoted team still closes the standings with eight games lost. Correcaminos' next round opponent will be Santos (#6) in San Luis Potosi. Huracanes will play at home against Laguneros and hope to get finally their first victory. The game in Puebla was also quite interesting. Fourth ranked Panteras (5-5) played at the court of 7th ranked Angeles (1-8). Panteras managed to secure a 5-point victory 77-72 on Sunday. Stedmon Lemon stepped up and scored 30 points for the winners. Panteras moved-up to third place. Angeles lost their third game in a row. Newly promoted team keep the seventh position with eight games lost. Panteras will have a break next round. Angeles will play on the road against Abejas (#5) in Guanajuato and it may be a tough game between close rivals. In the last game of round 9 Santos lost to Lenadores on the opponent's court 88-96. The most impressive stats of the last round was 18 points and 7 rebounds by Onzie Branch of Abejas. Bottom-ranked Huracanes (0-8) is still winless. This time they lost on the road their eighth consecutive match to fifth ranked Correcaminos (3-5) 114-84. Correcaminos dominated down low during the game scoring 68 of its points in the paint compared to Huracanes' 44. They outrebounded Huracanes 44-21 including a 30-15 advantage in defensive rebounds. 24 personal fouls committed by Huracanes helped opponents get some easy free throw opportunities. It was a good game for American swingman JR Giddens (196-85, college: N.Mexico, agency: Interperformances) who led his team to a victory with 36 points (!!!) and 9 rebounds. Naturalized American forward Aaron Perez (196-86, college: Oklah.Baptist) contributed with a double-double by scoring 19 points and 15 rebounds for the winners. Five Correcaminos players scored in double figures. Bahamas guard Michael Carey-Jr (196-93, college: Wagner) answered with 31 points and 5 rebounds and swingman Manuel Hernandez (193-91) added 12 points in the effort for Huracanes. The winner was already known earlier in the game, so both coaches allowed to play the bench players saving starting five for next games. Correcaminos moved-up to fourth place, which they share with Laguneros. Huracanes lost their eighth game in a row. Newly promoted team still closes the standings with eight games lost. Correcaminos' next round opponent will be Santos (#6) in San Luis Potosi. Huracanes will play at home against Laguneros and hope to get finally their first victory. The game between Top Four teams took place in Torreon. 4th placed host Laguneros (3-5) lost to first ranked Mineros (9-1) 93-83. Mineros outrebounded Laguneros 40-28 including 28 on the defensive glass. They shot the lights out from three sinking 12 long-distance shots on high 60.0 percentage. Mineros looked well-organized offensively handing out 24 assists. The best player for the winners was Dominican-Puerto Rican swingman Jonathan Rodriguez (196-87, college: Campbell) who scored 20 points, 9 rebounds and 5 assists. 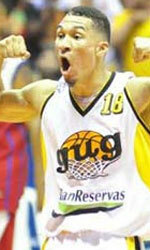 The former international power forward Fernando Benitez (204-89) chipped in 16 points and 8 rebounds. Mineros' coach used a ten-player rotation and allowed the starting five to rest. At the other side the best for losing team was naturalized American swingman PJ Reyes (196-88, college: Charleston) who recorded 18 points and American forward Carl Hall (202-89, college: Wichita St.) added 12 points and 9 rebounds respectively. Both teams had five players each who scored in double figures. Mineros have an impressive series of six victories in a row. They maintain first place with 9-1 record. Laguneros lost third consecutive game. Newly promoted team keep the fourth position with five games lost. They share it with Correcaminos. Mineros will have a break next round, and it should allow them to practice more before next game. Laguneros will play against Huracanes (#7) in Tampico and hope to secure a win. Rather expected game when 6th ranked Santos (2-6) were defeated on the road by third ranked Lenadores (7-3) 96-88 on Sunday. Lenadores looked well-organized offensively handing out 25 assists. American-Puerto Rican Javier Mojica (190-84, college: Cent.Conn.St.) stepped up and scored 25 points, 6 rebounds and 4 assists for the winners and naturalized Puerto Rican guard Joseph Soto (190-93) chipped in 22 points and 6 assists. The best for the losing side was American forward Chris Cayole (201-85, college: St.Michael's) with 26 points and the other American import point guard Jaron Martin (178-94, college: Cal-Irvine) scored 14 points, 7 rebounds and 6 assists. Both teams had four players each who scored in double figures. 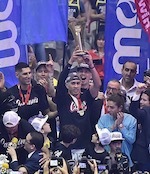 The victory was the fourth consecutive win for Lenadores. They moved-up to second place. Santos lost their fourth game in a row. They keep the sixth position with six games lost. Lenadores will face Fuerza Regia (#3) in Monterrey in the next round, which may be the game of the day. Santos will play at home against Correcaminos and it may be a tough game between close rivals. Very important is a road loss of third ranked Soles (4-4) against sixth ranked Libertadores (4-6) on Sunday night. Visiting Soles were crushed by Libertadores in Queretaro 115-95. Libertadores shot 62.7 percent from the field and made 20-of-24 charity shots (83.3 percent) during the game. Libertadores outrebounded Soles 39-23 including a 30-15 advantage in defensive rebounds. It was a great shooting night for Libertadores especially from behind the arc, where they had solid 55.0 percentage. Soles were plagued by 24 personal fouls down the stretch. The former international guard Cezar Guerrero (185-92, college: Fresno St., agency: Best of You Sports) nailed a double-double by scoring 30 points, 11 rebounds and 8 assists (perfect behind the arc making all five shots) for the winning side and American swingman Brent Jackson (193-94, college: Columbus St.) accounted for 32 points and 7 rebounds. Jackson is a former Eurobasket Summer League player, which is considered top international summer league in the market. International guard Luke Martinez (193-90, college: Wyoming, agency: Pro Sports) came up with 23 points and 6 steals and American-Dominican Antonio Pena (204-86, college: Villanova) added 15 points and 5 rebounds respectively for Soles in the defeat. Five Libertadores and four Soles players scored in double figures. Both coaches used bench players which allowed the starters a little rest for the next games. Libertadores maintains sixth place with 4-6 record. Soles at the other side dropped to the fourth position with four games lost. Libertadores will play against league's second-placed Capitanes in Mexico in the next round and it will be quite challenging to get another victory. Soles will play at home against the league's leader Aaguacateros and hope to get back on the winning track. The game in Puebla was also quite interesting. Fourth ranked Panteras (5-5) played at the court of 7th ranked Angeles (1-8). Panteras managed to secure a 5-point victory 77-72 on Sunday. American forward Stedmon Lemon (198-92, college: Johnson C. Smith) stepped up and scored 30 points for the winners and his fellow American import guard Hameed Ali (188-93, college: Texas A&M-CC) chipped in 13 points and 8 assists. The best for the losing side was Puerto Rican forward Carlos Lopez-Sosa (208-90, college: UNLV) with a double-double by scoring 19 points and 10 rebounds and Dominican Miguel Evangelista (-91) produced a double-double by scoring 14 points and 11 rebounds. Four Angeles players scored in double figures. Panteras moved-up to third place. Angeles lost their third game in a row. Newly promoted team keep the seventh position with eight games lost. Panteras will have a break next round. Angeles will play on the road against Abejas (#5) in Guanajuato and it may be a tough game between close rivals. The most exciting game of round 9 in the LNBP took place in Michoacan. This derby game ended with only three-point defeat on the road of 6th ranked Abejas (4-5) to first ranked Aaguacateros (7-1) 78-75 on Sunday evening. Host team only slightly avoided a big embarassment. Great defensive blocking was one of the keys in this match when Aaguacateros made 7 blocks. Colombian guard Michaell Jackson (190-87) stepped up and scored 15 points and 7 rebounds for the winners and the former international power forward Arim Solares (202-83) chipped in 10 points and 10 rebounds. The best for the losing side was American swingman Zack Irvin (198-94, college: Michigan) with a double-double by scoring 16 points and 11 rebounds and the other American import guard Keith Appling (185-92, college: Michigan St.) scored 19 points and 4 assists (went 10 for 10 at the free throw line !!!). Four Abejas players scored in double figures. Aaguacateros have a solid series of four victories in a row. They maintain first place with 7-1 record. Abejas lost third consecutive game. They dropped to the fifth position with five games lost. Aaguacateros are looking forward to face Soles (#4) in Mexicali in the next round. Abejas will play at home against Angeles and it may be a tough game between close rivals.